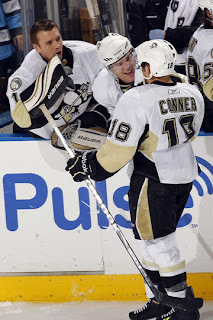 Chris Conner was called up a few weeks ago from WBS to fill in for struggling Mike Comrie and provide a spark for the Penguins' 3rd line with his incredible speed and stamina considering his size disadvantage. He had done everything the Pens hoped he would over the last few weeks, but tonight he did even more. Conner netted the game winning goal with 7 minutes to go that prevented Florida from completing their comeback and sent the Pens back on their way north with 2 points. After Mark Letestu received an outlet pass on the side boards, he attempted to drive past the defenders to the net. While the defense was focusing mainly on him, it allowed Conner to burn his man and get himself wide open in front of the net for the pass which he promptly pushed past Vokoun for the score. Long before Conner's heroics, the Pens seemed like they would have this one wrapped up much earlier. Kris Letang struck first on a powerplay with a laser blast from the point to put the Pens up 1-0 and finally put a marker up on the man advantage. But the powerplay momentum would not stop there because Sid Crosby would bury another PP goal 7 minutes later with a smooth deke right around Vokoun. Then the Panthers would get right back in it. With the final seconds ticking down in the first period Fleury made a save which popped straight up in the air. Before Flower could get himself across to finish the save, Cory Stillman came by and whacked the puck into the empty net. The goal was reviewed because it did hit off his hand, but the officials were unable to find any conclusive evidence to overturn the goal. Florida tied it up midway through the 2nd off a Bryan McCabe goal. Then it was up to the Pens PK unit to shut it down and keep the game leveled until Conner's goal. If it wasn't clear already...yes, it was Conner's goal. Offense: B Not their best performance against a sub par defense but Vokoun is always tough against the Pens. Plus, they got enough to win and that's all that really matters. Defense: B- Once again they weren't at their greatest and did allow way too many chances in the 2nd and 3rd, but they stepped up when it counted and kept the Pens ahead. Fleury: B+ The McCabe goal was soff but it was still a very solid performance from Fleury. Powerplay: A Wow, their powerplay was actually one of the most important deciding factors, going 2 for 3 and looking very good in the process. Penalty Kill: A Shut down the Panthers 0 for 5. Granted that the Panthers PP unit hasn't been ranked very high, it was still as good as it gets for the Pens' red hot PK unit. -Why was Mike Rupp scratched for Eric Godard? Nothing personal against Godard, but at least Rupp can be an effective in front of the net. -The other lineup change was Ben Lovejoy in for Engelland. I'd expect to see Eggy back Wednesday, but it must be noted that Ben played a very solid game. Always good to know considering how the Pens' d-men drop like flies with injuries. -Tyler Kennedy has picked his game back up to his 2009 level, and shouldn't even be considered anymore as one in danger of losing his sweater.